Start-up page of the login page. Educational, Adventure, single-player with Massively multiplayer online game elements. Poptropica is an online role-playing game, developed in 2007 by Pearson Education's Family Education Network, and targeted towards children aged 6 to 15. Poptropica was primarily the creation of Jeff Kinney, the author of the Diary of a Wimpy Kid series. As of 2015, he remains at the company as Creative Director. In the game, players can go to different 'islands' (game quest scenarios), compete in multiplayer games, and communicate with each other. The islands all have various difficulties, but all center on a problem that the player must resolve by going through multiple obstacles or completing goals. All islands, upon finishing, award "Poptropica credits" which are non-negotiable but may be used to buy costumes and special effects in the Poptropica store. 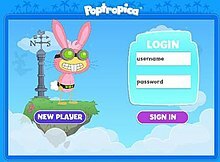 In 2011, Poptropica was listed on Time magazine's list of "50 Websites that Make the Web Great", where it was described as "an inventive megasite for kids with a wholesome and slightly educational bent." In 2012, Poptropica had an Alexa Internet rating of 1,302 in the United States, and a ranking of 5,162 in the world. By 2012, the game had grown to have over 500 million registered users, with 35 million in the 15-25 age group. Versions of the game have been released on Nintendo DS, and iOS mobile devices. In May 2015, it was announced that FEN was sold by Pearson to the interactive-education venture capitalist Sandbox Networks, and that Poptropica had "over 3.2 million monthly unique users in 200 countries and territories." In 2015, Poptropica was sold to educational-technology investment ground, Sandbox Partners. When it first launched in 2007, Poptropica only had one island, titled Early Poptropica Island. As of 2017, it has 58 islands to be explored, all with a different theme: examples include Back Lot Island, where your player helps produce a movie, and Super Power Island, where your goal is to defeat six super villains. Each island has its own quest, for which a player can receive an island medallion as well as 150 credits to spend in the in-game Poptropica Store. Starting July 6, 2011, Poptropica allowed players to replay islands without creating a new account, while still keeping track of all the Medallions the player had earned. In addition to the available island quests, advertisers contract for temporary mini-games that appear on the site, sometimes targeted to players of a certain age group or gender. Regular advertisers have included Disney, Kellogg's Froot Loops, Lego toys, and various animated movies and DVD releases. Advertisement mini-games normally appear only during a two-week period. If the player completes an advertisement mini-game, they receive a temporary prize, usually related to the media being advertised. A few Poptropica are themed after certain book series: these include Big Nate, Timmy Failure, Diary of a Wimpy Kid, and Magic Tree House. These islands are permanent, and can be played at any time. In 2015, a total of seven of these islands became members-only. Poptropica features different mini-games that users can play with other people. These include Switch, Sudoku, Hoops, Sky Dive, Paint War, Star Link, Balloons, Soupwords and Pathwise. The game keeps track of how many times the player wins or loses a certain mini-game. In August 2013, an island creator kit was made available for purchase. It is an activity book that walks the player through all the same steps the developers take when they make a new Island: coming up with a storyline, creating characters, and designing puzzles. In 2012, in partnership with Ubisoft, Poptropica released a new video game for the Nintendo DS, titled Poptropica Adventures. On September 5, 2013, Poptropica launched Poptropica: Forgotten Islands, an iOS game, which allows players to meet new characters and discover story elements about Poptropica by finding artifacts littered throughout the game. It was also released on the Nintendo 3DS system through Ubisoft in 2014. It has been replaced on iOS with a mobile version of the desktop Poptropica game. On January 11, 2017, Poptropica announced via their blog that they were introducing another game called Poptropica Worlds, developed in Unity. It was released in Spring 2017. Poptropica Worlds has new features, such as redesigned characters, customizable homes, and new Islands. Returning players are able to port over their avatar's look and name to Poptropica Worlds. Poptropica Worlds can be played on both the web and mobile. If membership was bought for Poptropica, it carries over to Poptropica Worlds, and vice versa. ^ Dossena, Tiziano Thomas (October 29, 2014). "From Lost Side Of Suburbia to Poptropica, An Exclusive Interview with Artist Kory Merritt". L'Idea Magazine. Retrieved January 10, 2016. ^ McCracken, Harry (August 16, 2011). "50 Websites that make the web great". TIME. Retrieved January 10, 2016. ^ Brian Solis (2010). "Virtual Worlds". Engage. Hoboken, New Jersey: John Wiley & Sons. ISBN 978-0-470-57109-5. ^ Rosen, Judith (May 21, 2015). "New Owner for Poptropica and FEN". Publisher Weekly. Retrieved January 10, 2015. ^ Dorbian, Iris (May 21, 2015). "Pearson sells Family Education Network to Sandbox Partners". Retrieved January 10, 2016. ^ "Pearson sells Family Education Network to Sandbox Partners - PE Hub". PE Hub. 2015-05-21. Retrieved 2018-04-24. ^ "Ubisoft and Poptropica partner to bring popular virtual world for kids to the Nintendo DS system". PRWeb. May 29, 2012. Retrieved January 10, 2016. This page was last edited on 19 April 2019, at 03:20 (UTC).